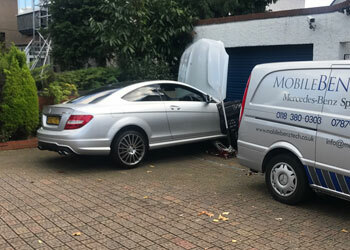 Mobile Mercedes servicing and repairs including Reading, Newbury, Bracknell, Wokingham, Oxford. All aspects of Mercedes servicing & repairs. Welcome to Mobile Benz Tech for convenient, reliable and competitively priced Mercedes servicing and repairs. For maximum convenience we come to you at your chosen time and location. Whether your Mercedes-Benz or AMG needs a routine service or emergency repair, you can trust us with old-fashioned values like honesty and integrity. We have been working on Mercedes, including main dealer experience, since 1996. With on-site servicing and repair, including MOT preparation and presentation, expert diagnosis and using recommended oils and genuine parts with 2 years warranty, you can count on us wherever and whenever your Mercedes-Benz needs help. We also provide a pre-sale service before you buy to identify any potential issues and provide you with peace of mind before your purchase. By bringing our service to you at a time and place at your convenience, there is no need for you to drop your car off at a conventional garage or pick it up again, so you can minimise disruption to your day and receive instant feedback on progress. Based at Reading we operate across Berkshire, North Hampshire and Oxfordshire including Basingstoke, Bracknell, Thatcham, Newbury, Woodley, Wokingham, Maidenhead, Pangbourne, Oxford, Abingdon, Didcot and Wantage. Contact us today on 07879 695874 to discuss how we can help keep your Mercedes-Benz running safetly and efficiently mile after mile! We bring our fully stocked workshop out to you on site offering a convenient, personal and cost effective option to main dealers for mechanical and electrical repairs for all Mercedes-Benz and AMG models. Experienced specialist using STAR diagnostics, the same tool used in main dealers. Repairs carried out to all mechanical and electrical sytems including MOT failures. All our servicing includes the updating of Service Record or Digital Service Book (2008 onwards). Using genuine parts and approved fluids ensures manufacturers warranty is maintained. First choice for mobile Mercedes servicing and repairs including Reading, Basingstoke, Bracknell, Thatcham, Newbury, Woodley, Wokingham, Maidenhead, Pangbourne, Oxford, Abingdon, Didcot and Wantage.